Finn's Weaver was formally described by Allan Octavian Hume, a civil servant, political reformer, ornithologist and botanist, who worked in British India. Hume built up a huge collection of bird specimens at his home in Shimla by making collecting expeditions and also obtaining specimens through his network of correspondents. He collected a female Finn's Weaver in far northern India and recognised it as a new species as it was much larger than the other Asian weavers. He named it with a provisional scientific name and with little description. Verreaux did not consider it a new species, and so Hume published a more detailed description 2 years after he first named it. Hume hoped to publish a magnum opus on the birds of India, but when all his manuscripts that he had been working on were sold by a servant as waste paper, he gave up ornithology. Hume gave his collection of 82000 specimens (258 types) to the British Museum of Natural History in 1874, including the type of Finn's Weaver. Hume's donation continues to be the single largest collection of Indian bird skins. Other authors also doubted the validity of Hume's new species. 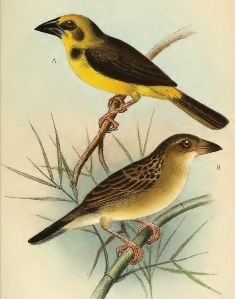 Frank Finn, an English ornithologist, rediscovered Finn's Weaver (only known by its Latin name at this stage) near Calcutta, including a male which had not been described yet. Finn published several notes on this weaver, establishing it as a valid species and thus E. C. Stuart Baker, a British ornithologist and police officer, gave the English name of Finn's Weaver to this species in honour of Finn's rediscovery. The first illustration of Finn's Weaver was by Finn (1901). Finn's Weaver does not seem to have been illustrated again for many decades. Ali Ali & Crook (1959) undertook the first study of the species and published black and white photos of its colonies, and also line drawings of the birds in display. Ploceus megarhynchus	Hume 1869,	Ibis, p.356	"The Terai" (Kaladingee, Kumaon Terai; Baker, 1926, Fauna, Brit. India, Birds, 2 ed., 3, p.69). megarhynchus Greek. Megas, great, large; rhunkhos, the bill. The Eastern Baya (Oates 1890). There is a type specimen in the British Museum (BM 1887.1.1.1660). Identification. Finn's Weaver is a large yellow weaver with dark ear-coverts, and heavily streaked upperparts. The female is duller. The female and non-breeding male Baya Weaver are smaller with a shorter, narrower bill and without the dark side breast-patch. 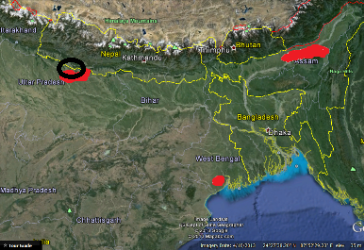 P. m. megarhynchus in Uttar Pradesh in India and just crossing into Nepal (see red on map). P. m. salimalii, in West Bengal and Assam in India (see white on map). The breeding male of this subspecies usually has a larger brown mask and paler belly to undertail-coverts. The global population is small and probably in rapid decline, due to human population pressure and loss of its habitat (terai grasslands). The recently discovered population in Royal Sukla Phanta Wildlife Reserve, in Nepal, probably has less than 50 individuals. This threatened species (see here) is regularly captured for the cagebird trade. Habitat. Finn's Weaver inhabits grassland with scattered trees, especially in seasonally flooded areas. It is also found in rice paddies and other cultivated fields. It roosts communally in tall grass and sugar cane. Food. Finn's Weaver feeds mainly on seeds, including hemp and rice, by foraging in grass and rice paddies together with other weaver species. It feeds its young mainly on insects. Breeding. Finn's Weaver is polygynous, with up to four females per male. It is colonial, sometimes breeding in association with other weavers. The nest is ball-shaped without an entrance tube, though it may have a porch-like projection over the entrance. The nest is lined by the female with soft grass-heads or bulrush fluff. The nest is supported by branches, not suspended as is the case in many other weavers. The leaves around the nests are stripped to make the colony more conspicuous. Adjacent nests may be close together and even joined by strands of material. Nests are placed high up in trees, or sometimes low over water in reeds and bulrushes. Possibly early in the season nests are built in trees, and later in reedbeds. 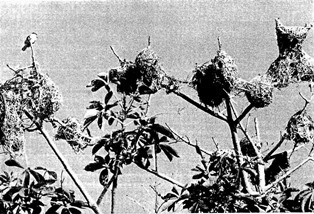 Finn's Weaver may nest in the same tree as nesting Black Drongos Dicrurus macrocercus, which attack nest predators such as raptors and crows. Some weavers nest in trees with jungle bees, also for protection from predators. The plain white eggs are incubated by the female only. The chicks are fed by the female, and sometimes the male helps. Nestlings have been taken by House Crows Corvus splenden and Large-billed Crows Corvus macrorhynchos. Several colonies have disappeared in recent decades, so it is critical to document as many colonies as possible, of this Vulnerable species.